It was raining cats and dogs in Manila last July 8 so I decided to stay home. At #Doctors20 I had announced that I might revive my Facebook page after a long pause as internet.org now provides free access via one major Philippine telco. 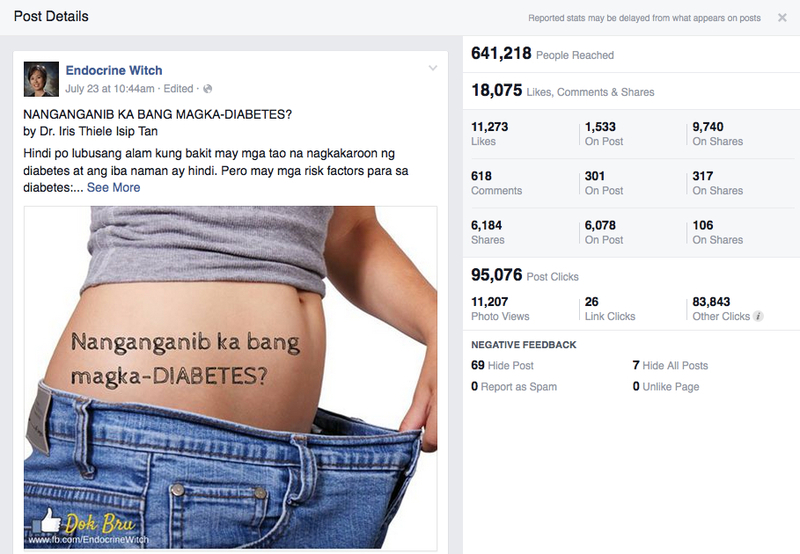 I’d read a lot of tips on how to engage with more people on Facebook pages. There’s one tip I had hesitated to try – Invite questions. I figured I had the time then because of the bad weather and did just that. Wow, I received about a hundred questions! I used Canva to make the poster. I’d discovered it a few days earlier thanks to a Facebook post by Remo (@bonedoc) about building a social media empire. 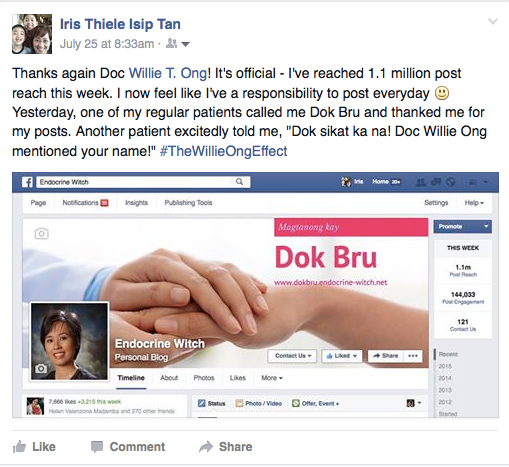 Dr. Willie Ong shared a few of my posts and my reach exploded. I call that the #DocWillieOng effect. 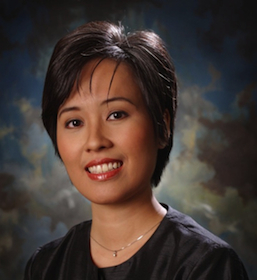 Dr. Ong is a cardiologist and author of several health books. He’s a columnist who also shares health tips on his Facebook page, which as of this writing has 689K likes! 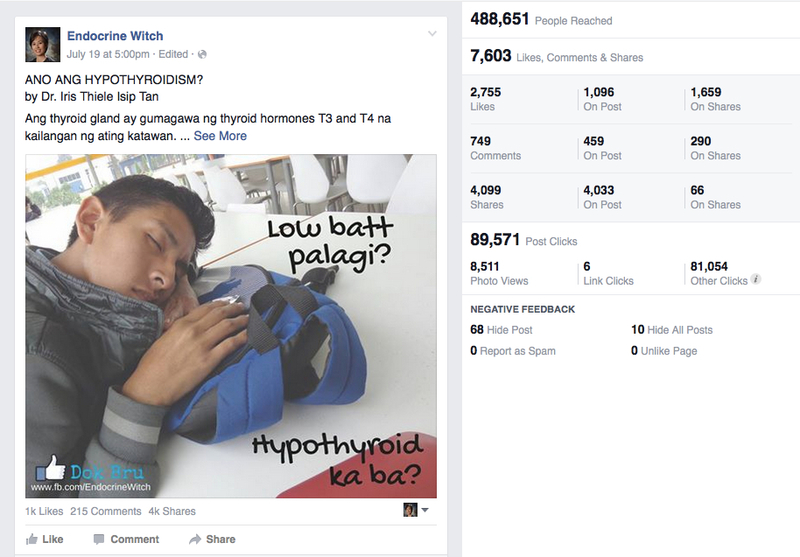 Because of his help, I peaked at 1.4 million post reach last week. 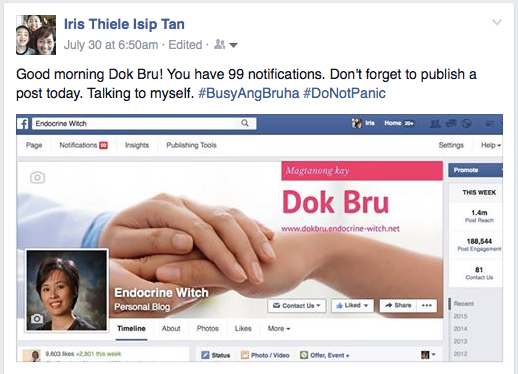 I’m also indebted to him for tips on how to manage a Facebook page. What are my top posts so far? No. 1 is an infographic about what happens to the body with one sip of cola. No. 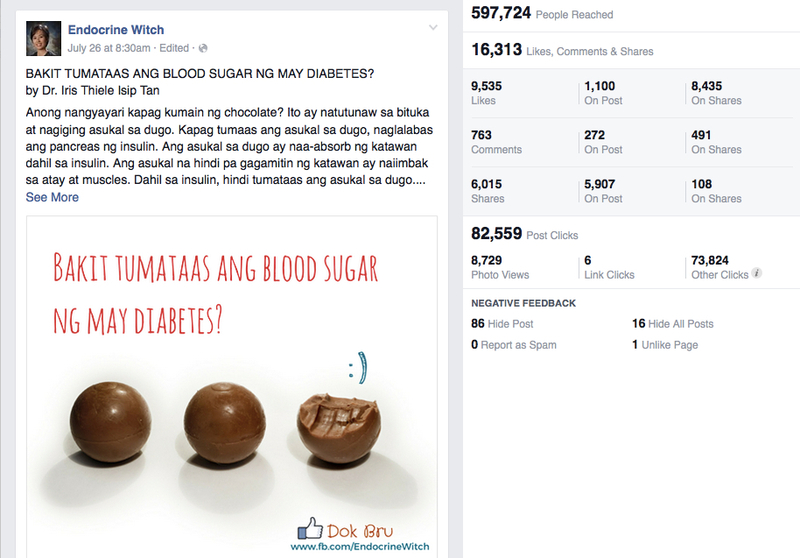 2 is a post talking about the risk factors for diabetes. I write all my posts in Filipino. The images are copyright and royalty free from Pixabay. Some photos are available on Canva for $1 each single use. No. 3 is a post explaining why blood sugar rises in diabetes. 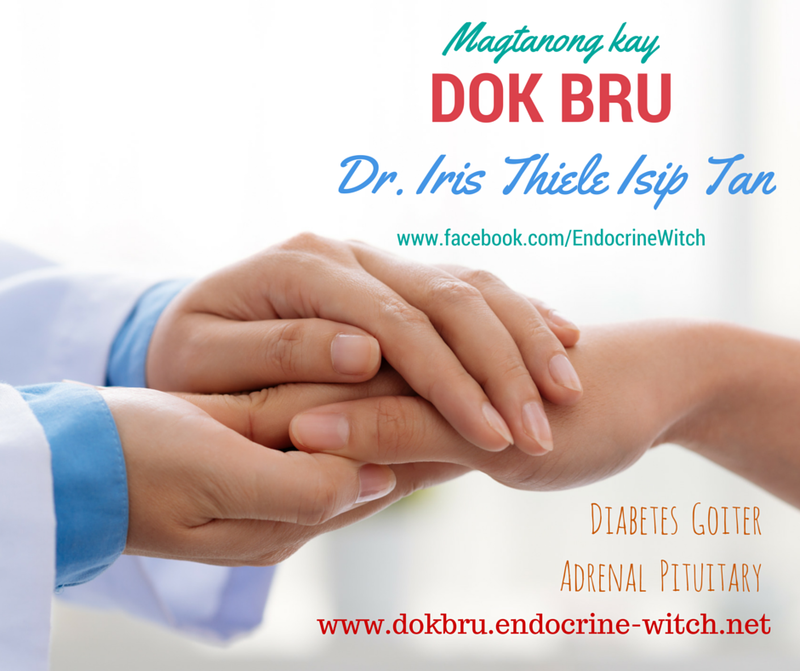 This was challenging not only to write in Filipino but also to explain in simple terms concepts such as insulin resistance and insulin deficiency. No. 4 is a post enumerating the symptoms of diabetes. I was able to use the old photos I had when I started this Facebook page in 2012. No. 5 is a post about the symptoms of hypothyroidism. There were many questions asked here that I could hardly keep up and answer everyone. I try to post at least once a day. I’m learning how to answer questions, which improves my communication skills. Someday, I’d like to write a paper about the questions the patients ask. I think we can learn a lot from these. Often the patients ask about things that they were unable to ask their own doctors. They also needed clarification about what the doctor explained to them that they could not understand. 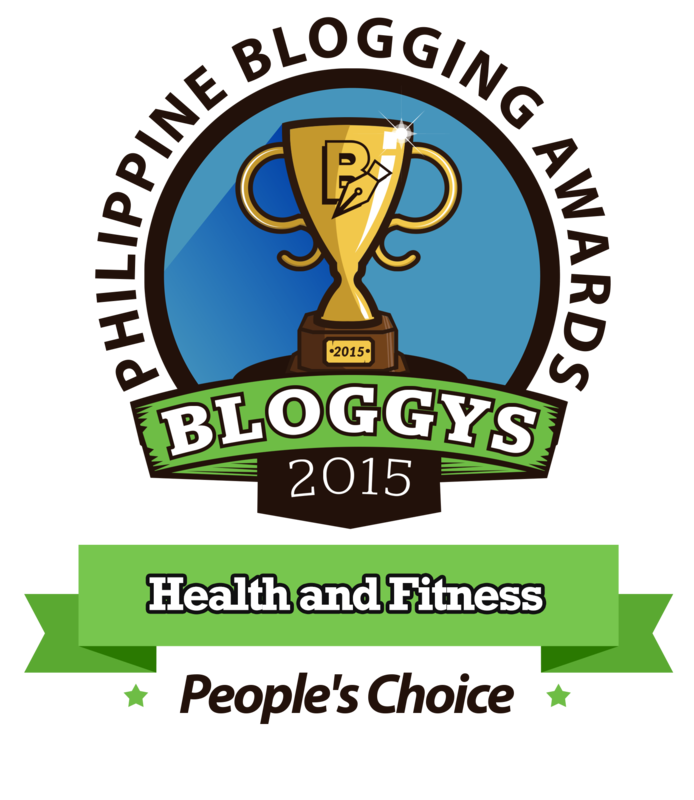 Many questions were from overseas Filipinos who did not have access to healthcare. I also had to set my own limits about what queries I can or cannot answer as this was NOT by any means an online consultation. 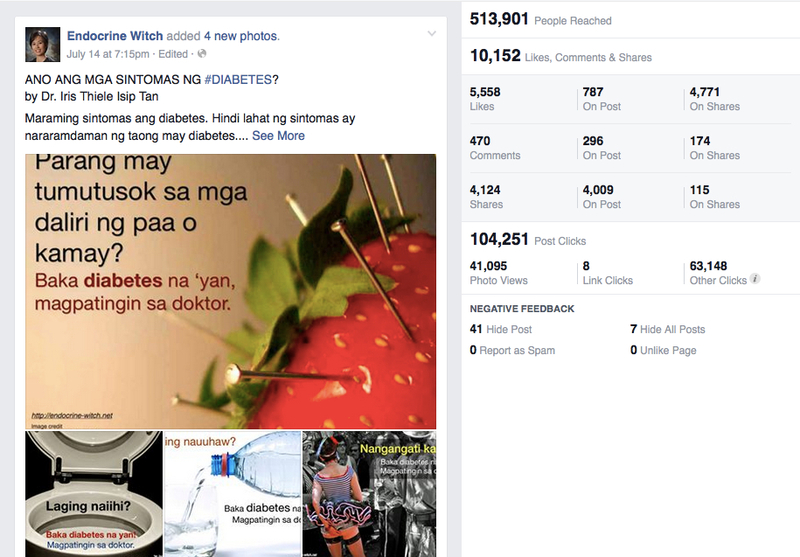 I learned to be patient with those who shared my posts to advertise products with no therapeutic claims. I weeded out comments sharing links to dubious products. 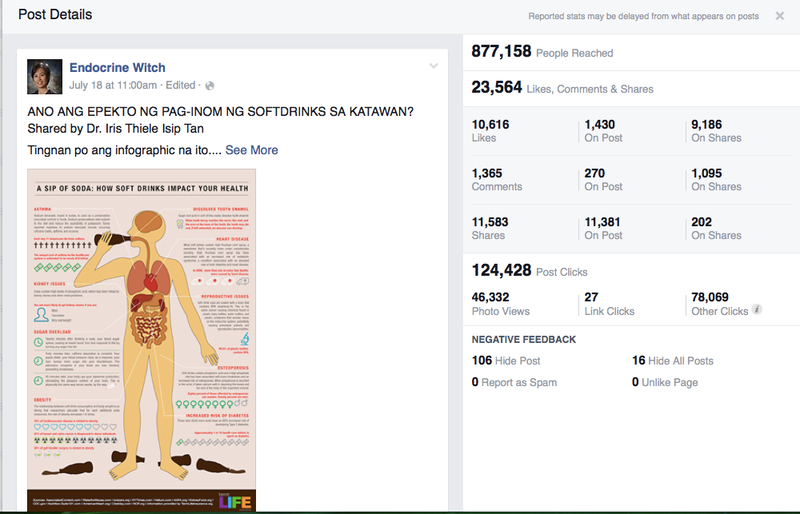 I even had to ask one group selling herbal supplements to desist from using my posts on their page. The most difficult question which I leave unanswered on my Facebook page is where my clinic is. I’ve asked some friends about this. They advised me to reply by private message about my clinic location and hours. But I rarely do so. Sometime ago I wrote about the ARK, Act of Random Kindness. I’d like to think that this FB page is my daily ARK. #ParaSaBayan. Though people may think otherwise, I did not set up this page to gain more patients. The lines at my clinic are more than long enough. I’ve said it before, I haven’t solved long waiting times yet. I am grateful to those who have left messages of thanks and encouragement for me to continue with this. Thanks again for your great job and please please never stop doing it!!! Lots of kisses from Spain and hope to see you in another event!!! Thanks so much Nuria! You have no idea how your simple message has warmed my heart and given me strength to continue 🙂 yes, hope to see you again!